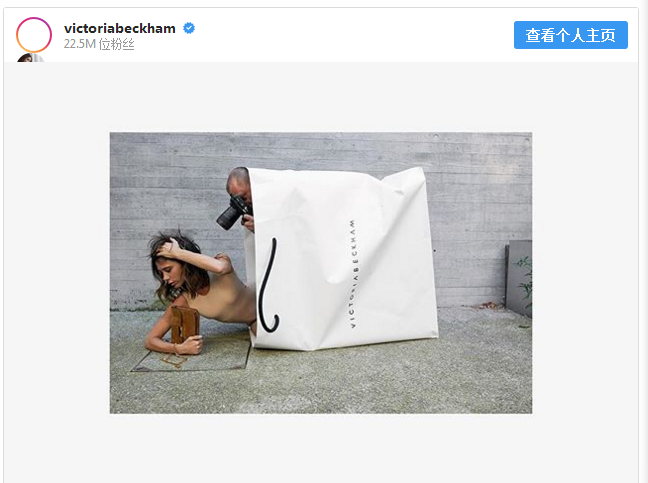 Victoria Beckham has marked her decade-long run in the fashion industry with a recreation of her iconic bag shoot with Marc Jacobs. Taking to Instagram, the 44-year-old former Spice Girl hilariously posed from within a vast carrier bag adorned with her brand's logo as she displayed her legs from underneath the bag before lying down and exposing her face. The images, shot by German photographer Juergen Teller, will appear on a line of T-shirts set for release by the star. 'So what better way to illustrate the story of the past ten years than by revisiting the creative? So excited to share this campaign with you shot by the brilliant Juergen Teller. Head to the link in to shop the tee featuring the campaign x VB'. At the time of the shoot, Teller revealed: 'I told her "You're the most photographed woman in the world. And fashion nowadays is all about product - bags and shoes - and you're kind of a product yourself, aren't you?"... She was, like, 'Uh, yeah'." Back in 2014, Victoria spoke about the origins of her brand, writing: 'I hope by sharing my story, I will inspire others who are interested in fashion and encourage them to work hard and follow their dream as I did'.